For the style-conscious, the look and feel of any gadget is almost as important as how well it performs. Fujifilm's new FinePix F11 should satisfy on both counts because you can get almost as much pleasure from looking at the sleek lines of the beautifully finished camera, and playing with its neat and functional controls, as from the images it produces. It simply oozes build quality. 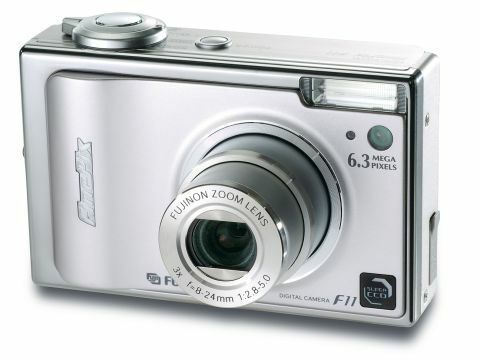 More than just a pretty face, the F11 is fitted with Fujifilm's latest 1/1.7-inch Super CCD sensor. In spite of the large physical size, the sensor only offers a maximum resolution of 6.3Mp but, to our mind, that's plenty and the spin-off is that image noise is low. Better still, the impressive noise performance enables a super-fast 1600 ISO sensitivity setting which is actually usable. A small amount of built-in memory is in vogue for compact cameras, which is ideal for emergency use if you run out of memory card space at exactly the wrong time. The F11 has no built-in memory, but - even worse - it relies on the far from common xD Picture Card for storage. This can work out a lot more expensive than the comparatively ubiquitous SecureDigital and MultiMediaCard formats, although you do at least get a starter 64MB xD card with the camera. At least battery life isn't an issue, with the camera managing to extract around 500 shots from a single charge of the Li-ion cell in our tests. This is even more remarkable considering the fact that you have to use the large, clear and bright 2.5-inch LCD for framing shots, in the absence of a separate viewfinder.